Impossible to resist with flaming red, tightly packed double blossoms and silky deeply fringed petals, Papaver somniferum var. paeoniflorum 'Scarlet' is a spectacularly outrageous poppy. Perfect for gardeners in pursuit of an easy-to-grow flowering plant, these plants are showstoppers when they're in full bloom, the tallest are at eye level. With their impressive variety, spectacular blooms and strange seed pods, Peony poppies are one of the easiest ways to add a bit of architecture and a lot of dazzle to your garden. 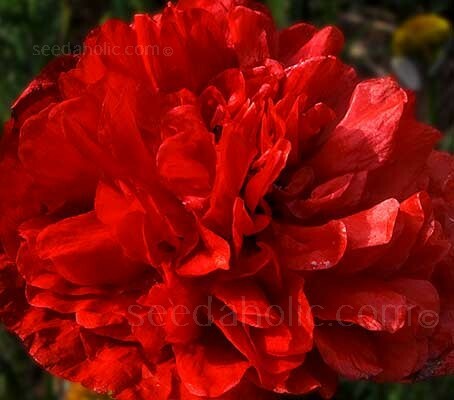 Peony poppies send up thick flower stems that rise as high as five feet and produce five to ten nodding flower heads. When the flowers do burst, overnight, from their casings, the gardener is treated to some of the most dramatic flowers in the plant kingdom. As if this weren't enough to tempt any gardener, once the petals drop, one is left with a spectacular, instantly recognisable seedpod. These poppies grow quickly. Grow them in a position with deep, well-drained, fertile soil in full sun, they can also be grown in large containers. Give the plants sufficient water to increase both the number of flowers and their individual size. Enrich the soil with manure, compost or bone meal ahead of planting, or use any organic fertiliser rich in nitrogen. Although these poppies gobble up the nutrients, their eventual show will be more than worth the proper environment. Sown in spring the plants will flower June to August. If sown in autumn they will flower from May onwards. If sowing more than one annual in the same bed, mark the sowing areas with a ring of light coloured sand and label. The seedlings will appear in rows 6 to 8 weeks after planting and can be told from nearby weed seedlings quite easily. If sowing early in spring remember that young seedlings are susceptible to frost so do protect them with some garden fleece if it is forecast. When sown in autumn the plants will form a tap root which is fairly hardly, so while the leaf above ground will be lost over the winter, the plant will shoot from this tap root again in the spring. Thin the seedlings out so they are finally 30cm (12in) in apart by early summer. Be ruthless, just leave the biggest and most healthy looking. By doing this, you'll get more flowers and pods per plant that are bigger and stronger. Poppies don't need to be watered too often, but when you do water, give the plants a deep soaking. This will promote strong root growth. After about 6 to 8 weeks of growth, add a high Phosphorus fertiliser for the flowering stage. The most serious problem for these poppies is root rot. Excellent drainage is a must. Snails find the young leaves very tasty, so a snail deterrent is recommended. They can be prone to grey mould, but usually this is only a cosmetic issue. Once they get established the plants are very hardy. The seeds can be used for cooking and baking or can be stored ready for next year. The seeds can be used in cooking but if eaten raw can cause mild stomach upset. Poppy is generally believed to stem from West Asia, although more recently a West Mediterranean origin was suggested. The poppy was cultivated in Europe since the Neolithic era some six thousand years ago. It is probably one of the earliest plants cultivated in that region. The genus name Papaver is classical Latin for the poppy plant. It appears to have no Indo–European cognates and cannot be explained further. The Latin word lives today in several languages, in French pivot and Portu­guese papoila. It is also the source of English word poppy (Old English popæg). The species name somniferum comes from the Latin somnus meaning ‘sleep’ and ferre meaning ‘bring’. It refers to the narcotic properties of opium. There are similar words and meaning in other languages, in Spanish adormidera is from Latin dormire meaning ‘to sleep’. Papaver somniferum varieties are commonly known as ‘Bread Seed' poppies, the plants are the source for commercial seeds used in baking, salad dressings etc. They are also known as Opium poppies. The term is from the concentrated latex obtained from unripe capsules has been used since Greco-Roman times. The word is related to Greek opos meaning ‘sap’ or ‘juice of plants’. To clarify, while it is perfectly legal to grow these plants in the garden, it is illegal to use the plants for anything other than their intended decorative uses as an ornamental flower.